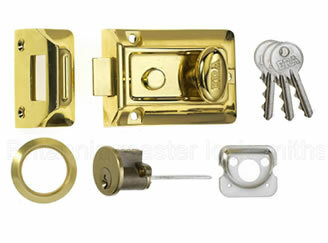 Night latch is the correct terminology for what most people call a Yale lock. 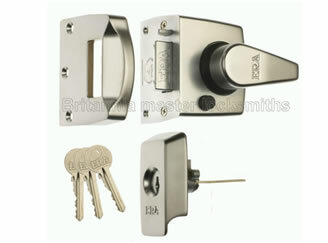 It is simply a latch operated by a turn from one side and by a key from the other side (Rim Cylinder). Sometimes they are called slam locks, due to the reason that once the door is closed behind you need a key to come back through the door. These locks always need a key to unlock them from the outside. 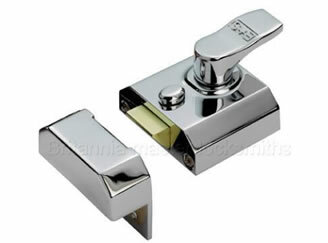 The latch can be deadlocked in an open or closed position by sliding the button on the inner face. These sorts of locks are really at the bottom of the pile for security and were being supplemented with mortice deadlocks by the late 1960s. If your door has a multipoint lock then there will be a latching bolt in the middle of the door that is operated by the handle. The rim nightlatch with lockable internal handle. These locks are the same as the nightlatches except you can deadlock the latch from the outside with a turn of the key. This means that the latch cannot be slipped with a piece of plastic. Some of them also allow you to lock the turn knob on the inside with the same key (instead of the button) and this will prevent slipping from outside and the knob being turned by sticks, cables and so on through the letter plate. These differ from the above two in having a deadlocking pin just above or below the latch. When you close the door the pin is depressed into the mechanism and it deadlocks the latch, which will prevent slipping.